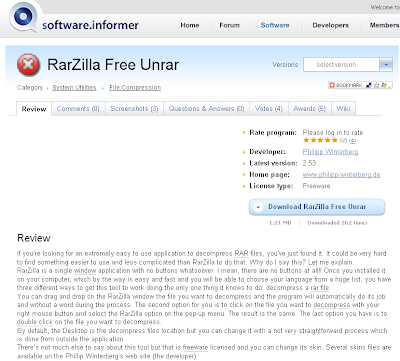 My free Windows tool "RarZilla Free Unrar" has been tested and recommended on informer.com: "If you’re looking for an extremely easy to use application to decompress RAR files, you’ve just found it. It could be very hard to find something easier to use and less complicated than RarZilla to do that. Why do I say this? Let me explain. RarZilla is a single window application with no buttons whatsoever. I mean, there are no buttons at all!! Once you installed it on your computer, which by the way is easy and fast and you will be able to choose your language from a huge list, you have... "